In everyday, you are using various tools to schedule meeting like Outlook, Emails etc. In winter’14 release Salesforce.com has come out with great features that will help make scheduling meetings without using any third party tool. Now you can use Cloud Scheduler to request and schedule meetings with your customers and coworkers. This feature can help with user adoption of your Salesforce system. 1) You can invite up to 50 people to a meeting. Invitees can consist of only contacts, leads, or person accounts, only other Salesforce users, or a mix of both. 2) You must have at least read access to the contacts, leads, and person accounts that you request a meeting with. 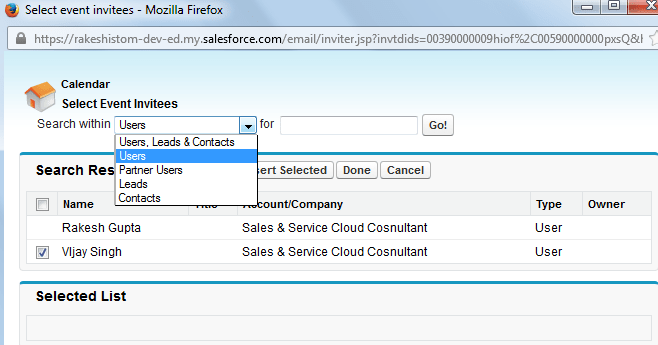 3) Each invitee must have an email address specified in their record so Salesforce can send them a meeting request. 1) Upload a copy of your organization logo to Documents and make sure that the image is externally available. Don’t save it under “My Personal document” other wise you will get an error in next step. 2) Add/Remove “New Request Button” to the Open Activities related list on contact, lead, and person account page layouts. To do That follow the steps Name | Setup | App Setup | Customize | Activities | Cloud Scheduler. 3) Choose to show your custom logo in meeting requests. To do this follow the path Name | Setup | App Setup | Customize | Activities | Activity Settings and select “Show Custom Logo in Meeting Requests” check box then select logo from the document. 1 ) You can schedule meetings from a contact or lead, person accounts or Calendar section on the Home tab. Go to Open Activities related list and just click on the “New Meeting Request” button. It will opens up a new new overlay. 2 )Now click on “To” invite other Salesforce users, leads, contacts, or person accounts to the meeting. You can select the type of invitee from the drop-down list. select invites and click on Done Button. 3) Next Enter a subject and location as per your choice. a) I propose meeting times—You can propose up to five meeting times by picking times in the calendar. 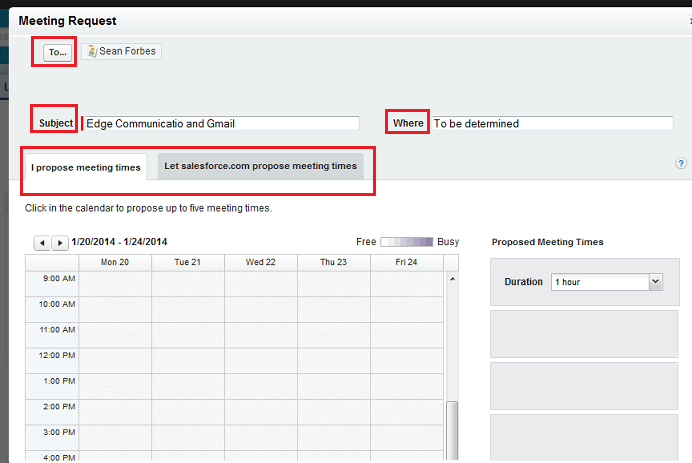 b) Let Salesforce propose meeting times—Allow Salesforce to propose up to five meeting times for you based on your calendar availability. 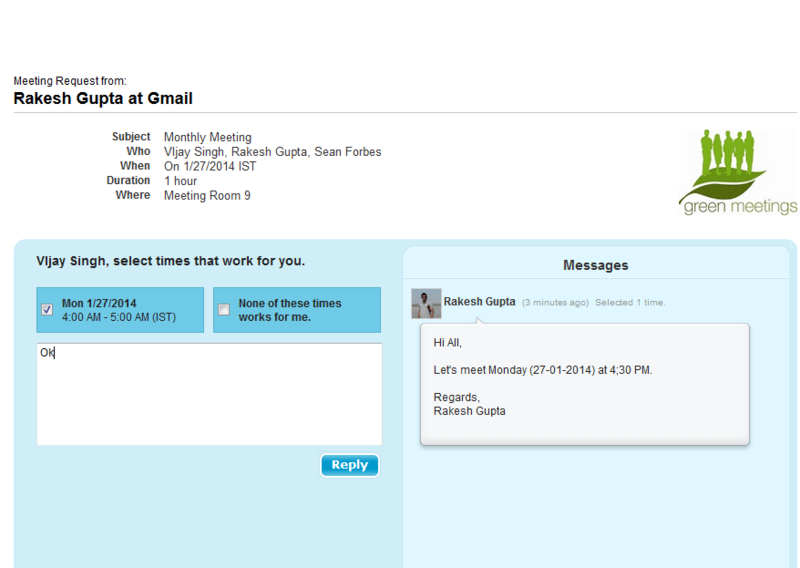 6) You can write a message to the invitees, and click Send, Salesforce emails a meeting request to the invitees. 7) Salesforce captures all of this information for you in the open activity related list. 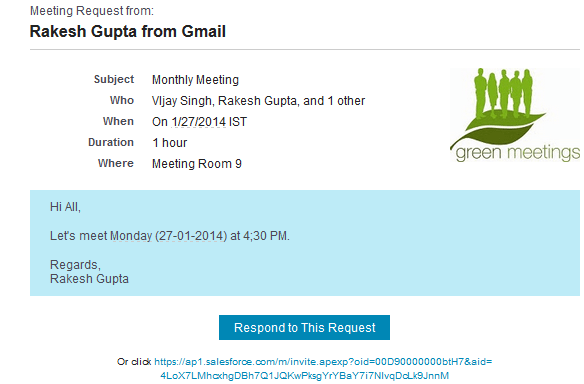 8) In the meeting request, invitees click “Respond to This Request” to open your meeting’s Web page. On the meeting Web page, it allows invitees to choose which time works best for them. 9) Accept invite or proposed a new time, the web page includes messages that invitees write when responding to your request. 10) Confirm the meeting and your new meeting will appear on your calendar. To reschedule or Cancel a meeting, open a meeting then click on “Reschedule” or “Cancel” button, Meeting details will remove from your calender and Salesforce will notify all invitees via email. Is there a way I can automate sending meeting invites to users. For example, beginning of every quarter there in a requirement to send training invite to the different managers and people under those managers. What could be the best way to achieve this. Automatically or by clicking on Send Training invite button/Check box User1,2,3 and Manager gets an email invitation for training. 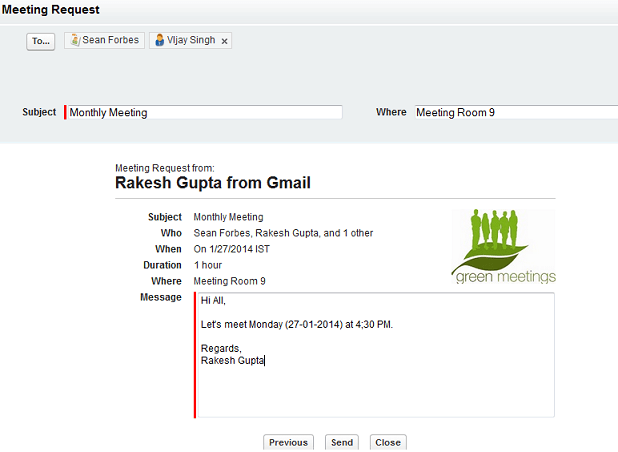 Hi Rakesh, After the invitees accept the meeting request a new event will be created automatically in the system. In my organization, We have different types of events for which i have created event record types. How can I tell scheduler to allow user to select a event type so that I can have work flow rules on the event object based on the record types.